An 84-year-old woman was attacked and robbed by three men in her home in Glasgow. 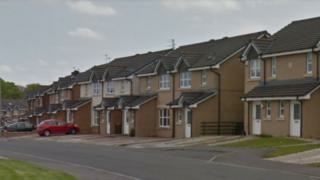 The thieves forced their way into the pensioner's house in Bowhouse Drive, Castlemilk, at about 21:20 on Tuesday. Police said they ransacked the house before escaping with jewellery and money. The woman suffered a wrist injury during the attack and is being treated at the Queen Elizabeth University Hospital. A Police Scotland spokesman said there was limited information on the three suspects who are all white. Inquiries carried out so far have revealed that an Audi car was seen in the area around the time of the incident and officers have appealed for witnesses to come forward. Door-to-door inquiries are also being carried out while CCTV footage will be studied for any additional information. Det Insp Clark Hill said: "This has been a very frightening experience for an elderly lady in her own home. "She has sustained an injury in the incident and has lost items of jewellery which are extremely precious to her. "I am appealing to anyone who was in the area around the time of the incident to think back and consider if they saw anything which seemed a little suspicious. "Did you see the Audi car, did you notice three men hanging around the area? Any small piece of information could prove vital and help us identify the men responsible for this despicable crime." He added that additional officers would be patrolling the area to reassure the public.